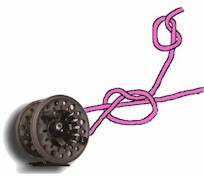 This is the common indicator knot used to attach indicators to tippet or leaders. It very easy to tie. 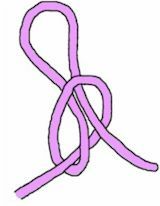 It's a granny knot except you make a loop instead as shown in the picture. Put your indicator material through the loop, pull tight and trim your indicator to the required size and away you go. NB. I find this knot breaks fairly readily so it's best not to use it on finer tippet and to give it a pull test every so often to check it's strength. Form a half hitch in the appropriate spot on your leader / tippet and place your indicator material in the loop, pull tight. Then make another loop in your leader / tippet and thread it over the indicator and pull tight. This will lock the indicator in place. If you don't use the extra loop you'll find the indicator slips. Trim to size and you are ready to go. To remove this indicator separate the indicator fibers by pulling them apart at one end of the indicator to open up the knot. One of the best is just some natural sheep wool, it comes per greased, being white in color it looks like surface foam and stand out quite when on the water surface. Water Shed Fly Floatant so you don't have to continually add Fly Floatant to it and you'll be in business.